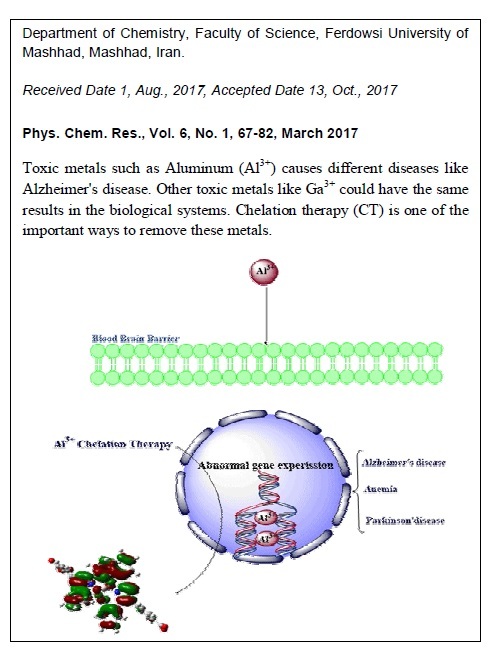 A theoretical study was performed to evaluate the defersirox potency to chelate aluminum (Al) and gallium (Ga) as the toxic metals in biological systems. Deferasirox as an important class of chelators, which binds to the metallic center with the ratio of 1:2, is used to remove the toxic metals in the case of iron overload disease. The effects of water and DMSO as the solvent on the electronic nanostructures of [Al(DFX)2]3- and [Ga(DFX)2]3- were investigated by using the density functional theory and compared with the gas phase results. Natural bond orbital and quantum theory of atoms in molecules analyses was carried out to understand the nature of the complex bond character in the complexes. Topological analysis verified that deferasirox –aluminum complex is more stable than gallium complex, which is in good agreement with the experimental data. Natural charge analysis revealed that aluminum has a more positive character in comparison to gallium, therefore electron-donor atoms of the deferasirox bind to aluminum more favorable than gallium. TD-DFT studies showed a blue shift in the absorption spectra for the complexes in the presence of solvent. Based on different analyses, deferasirox is considered as a good chelator to remove aluminum and gallium cations in the biological systems.